My mother says that this blog becomes repetitive and monotone. It's always prejudice this, discrimination that and a continuous ad for Conductive Education. But it's not because of a lack of fresh material or ideas what to write about. Life just happens to me. Freshly offensive or insensitive things encounter me frequently. Often it's something similar to what happened before, so I write about it again. I wanted for it to become a channel for Cerebral Palsy awareness from different angles. It doesn't happen with just a post or two. Awareness happens when you stay on course. To get the message across you need to harp on the same topic tirelessly, maybe someone will listen. And I'm just as annoyed that certain things happen again as my mother is reading about them. And I write about what I know- my own experiences. Last weekend I had to send a message to the mayor about something I have written before: wheelchair ramps blocked this time by a city art fair fencing. To the city's credit, his staff was very responsive and followed up as soon as I posted about it on Facebook and Twitter (Yes, I'm friends with the mayor on Facebook as well as some of his people) and for the second day of the event the fence was moved, freeing up the ramp. I'm happy with that although it never should've happened. Maybe one day I will not have to write about ramps and access anymore and my mother will not be bored? The Art Fest is something we all should be able to enjoy, so couldn't it be set up in a way that doesn't block access to my downtown apartment forcing me to go back and around a block? 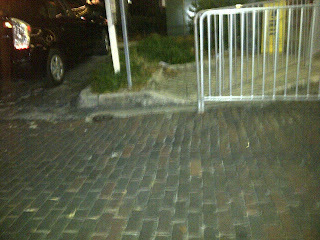 Don't they have shorter fences that don't use up all the sidewalk? Wheelchair ramps are there for a reason and they are not suitable for setting up tents and fencing. Walking people can walk off of a sidewalk in any spot and can easily get around the obstacles, I can't. 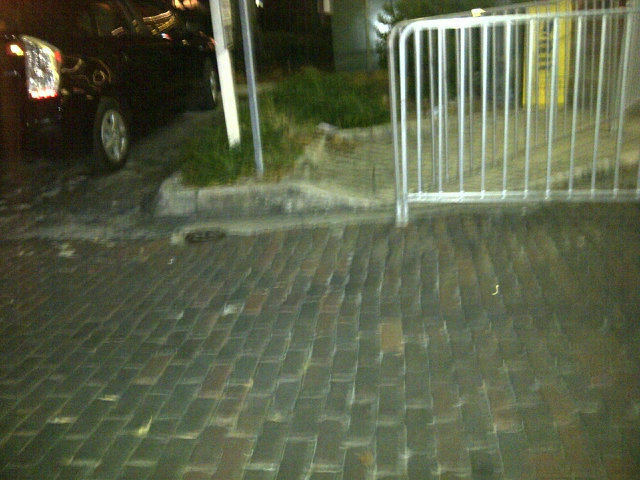 http://yfrog.com/nt4ssokjSomething to think about, City of Gainesville crew"